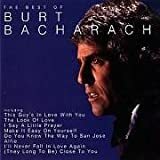 作曲は Burt Bacharach (バート・バカラック), 作詞は Hal David.古き良きポップスの地上最強コンビ. Start with a man and you have one. Add on a woman and then you have two. Add on a child and what have you got? You've got more than three. You've got what they call a family. It just takes wood to build a house. Fill it with people and you have a home. Fill it with love and people take root. Just like we're doing now, together.